I love starting a new year with a plan! I like to do a lot of reflection in between Christmas and New Years. It gives me a chance to sit back, recall all of the good and bad that happened over the year. I also get to measure how well I did on some yearly goals. For many, creating New Year’s resolutions is what drives them all year round. For me, not so much. There are countless goals I have made for myself that end up falling short midway through the year. Not because I don’t want to accomplish them (I have every intention to! ), but because life gets in the way. So, in efforts to ride the wave of life AND feel somewhat accomplished by the end of a year, I rather focus on tiny bites of goals over time to help me stay on track. And for that, I need a solid game plan. I need to know what to do and when to do it. I need to know what’s more important and where I should even start. If you’re anything like me, then you need the right tools to get you there. So, something I’ve been doing lately is gifting myself with some really useful gifts that will help me stay focused and goal-oriented all year round! I’ve come to realize that in order to find balance in what I want to accomplish AND how to take the best care of myself throughout the New Year, I need several tools that I can use that would compliment each other. Each of the gifts I’m listing has a set purpose and will help you get the most out of your New Year. Feel free to check them out and add them to your gift list! Perhaps they could transform the way you head into your New Year! Everyone needs a really good planner. Whether you are a stay-at-home mom, college student, or boss lady #1! A good planner differs based on your need, your likes, and what you ultimately need to jot down to help you through your days, weeks, and year. For me personally, there are days when I don’t have anything planned, so a daily planner wouldn’t necessarily work for me. BUT, I do need something that would help me set up my weekly and monthly goals! Figure out what works best for you and go along with that. Below I’ve included a few planners that are tried and true to be some my most favorites! This is the planner I decided to go with this year. I went with this planner because it is very specific to the goals I have that revolve around my faith and personal wellbeing. Each day has space for your typical schedule, praise and gratitude, physical health, daily prayers, and your top priorities. There’s a Bible verse for every day, and there are spaces for your yearly prayers and top goals. If you’re someone who wants to focus on their strengthening their daily walk with God while getting their life in order, this is a great planner for you. You can shop for the Prayerful Planner by clicking here. What I really like about these planners is that they are divided into different sections. I use one each year for my business (which contains quarterly, weekly, and daily goals, my quarterly budget, weekly check-ins, and space to hash out your top weekly business priorities). I’ve also used their Wellbeing and Fitness & Training Journals too! Though somewhat similar, the Wellbeing journal focuses on your health as a whole, whereas, the Fitness Training journal is really good if you’re on a specific program/diet where you’re looking to see change over a 12-week period. Others journals they sell focus on Yoga, Family/Parenting, and their standard Daily journal. These planners come in both a daily and a weekly option (prices vary) so if you like to plan your day or just need a quick weekly overview, this planner would be great. One really, really cool thing about this planner is that once you purchase one, you get free tips and bits of encouragement each month in your inbox from the creator, Emily Ley. I thought this was a really nice touch to the actual planner because it helps you to plan more efficiently. To shop these planners, click here. I can’t speak enough about this powerful resource. While this isn’t your typical planner (as in, there aren’t spaces for you to fill out your next meeting or doctor’s appointment), it does help you narrow in on what you wanna focus on in your seasons. Basically, you’d use the Powersheets to help you get very crystal-clear on what you’d like to see happen in your New Year, then you use that to set up your planner to match those goals, visions, and desires. Then, the Powersheets help you reflect on what worked, what didn’t, what you’ll say “no” to next time, which relationships you’ll spend more time in, and the list goes on and on. 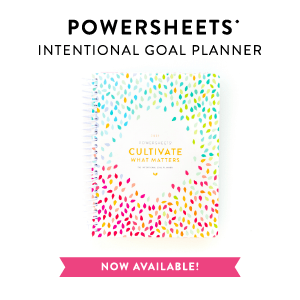 Even if you decide that you don’t necessarily need a planner for your New Year, you should at least get Powersheets to help you stay focused and intentional throughout your year. At the beginning of every New Year, I spend a LOT of time drawing near to God. I like to do this to really get some direction and discernment of where He’s going to lead me in that year. By doing this in January, I almost feel like I have the rest of the year to set out His plan and purpose over my life. This is exactly how my husband and I decided to buy our first home, decide if it was a good year to have our children, and know which steps to take in my business. Trust me, doing this is always a good thing at the dawn of a New Year. With that being said, I usually try to find a good devotional or Bible plan to follow for that season. Sometimes, I use devotionals that are only a month-long. Others can take up the entire year. Choose something that’s gonna work best for you! Right now, I’m really jamming out to the Proverbs 31 Ministries First5 App. This app is created to help you connect with God during the “first five” minutes of your day. It goes through various studies of the Bible (all focusing on different books of the Bible). Each day, they devote to one chapter of their chosen study, and then you read an accompanying devotional. There’s a prayer involved and a space for reflection. It’s truly my favorite way to go through and digest the Bible throughout the entire year. Did I mention this app was free? Yeah, jump on that! Click here to learn more about the First 5 App. YouVersion is another great app that can be used in your devotional and Bible study needs. This was kinda one of the first Bible apps out there so since the time it was created to now, there’s a TON of resources for all ages. This app contains the entire Bible (and all of the various versions) including options to hear the audio version or to read it offline without internet connection. Another good thing about this app is all of the devotionals that go along with it! Literally, hundreds of them ranging from every topic you can think of. If you want a three-day devotional or one that lasts all year, you’ll find it here! Did I mention this app is also free? Check it out here. I don’t know about you, but sometimes it’s really nice to slow down and express your thoughts in a more old-fashioned way. Nothing will ever beat a good-ol’ letter in the mail, with your actual handwriting, and your loving words. I’d like to suggest that you stock up on your blank cards and other stationary for those thank-you’s, thinking-of-you, and quick words of encouragement. It takes about 10 minutes to do but because we never have the resources we need (like stamps!) we never end up doing this! So, to save yourself the runaround that could potentially lead to never getting around to this, stock on some really cute blank cards, envelopes, stamps and a nice set of pens. Collecting a few addresses from your favorite people wouldn’t hurt either! Journals are life. Not the ones where you gotta fill stuff in. I’m talking about just the blank, clean, fresh journals that are open and inviting. Nothing beats a journal to jot down your thoughts, dreams, visions, frustrations, prayers, experience, and just life in general! I love to start fresh with a new journal every New Year because it marks a clean slate for me to record. I can’t even to tell you how many times I have gone back over the year to reread what I wrote during certain seasons of my life. Sometimes looking back can help you move forward. Other times those post journal entries will remind you of how far you’ve come. Either way, getting a nice journal to dig into for your New Year is exciting and needed. What are some gifts that you’ll be giving yourself for your New Year? Share what they are in the comments below!! Great gift ideas! I’ve always wanted to be a planner because I see so many cute ones everywhere, but I’m just not – not in my blood I guess. I did, howeve, just purchase a new journal that I’ll be putting to good use. Merry Christmas! !